Students raised more than $3,000 by designing and selling t-shirts on campus. The funds, and Pacific Ridge polos, were delivered to provide a bit of relief to the students, many of whom lost family and shelter in the earthquake and were in dire need of resources. 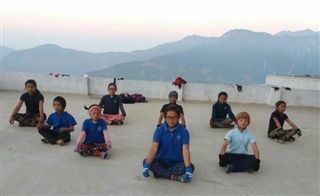 In early January, Yangrima expressed thanks by sending this beautiful photo of students meditating in Pacific Ridge shirts. The school is currently operating out of temporary facilities while the lengthy rebuilding process takes place.